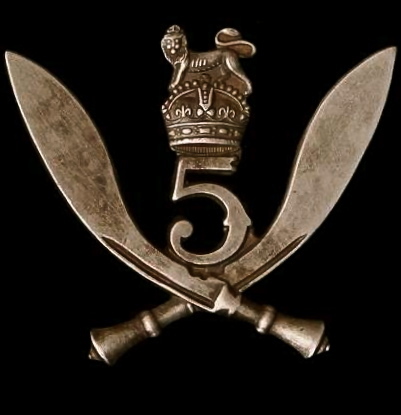 Cap badge of the 5th Gurkha Rifles. William George Kirkpatrick was the son of William C. and Elizabeth A. Kirkpatrick from the parish of Braddan on the Isle of Man. 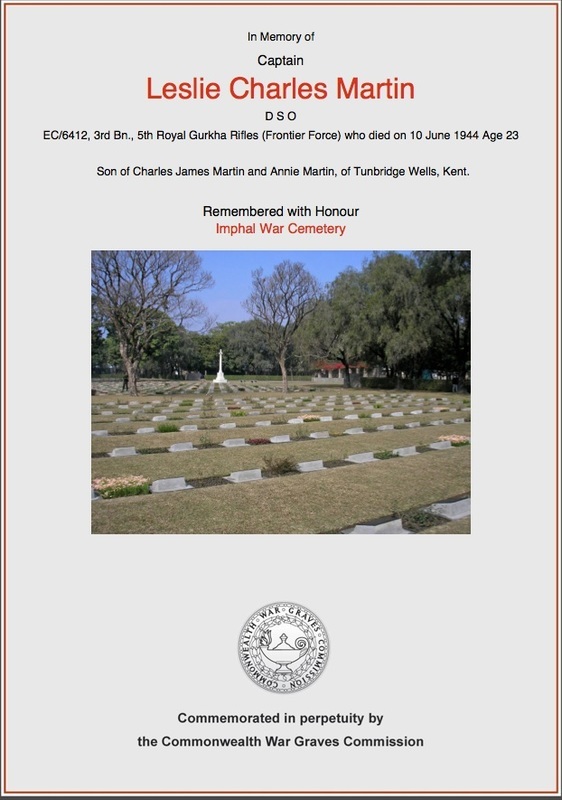 William received his Indian Army commission on the 15th March 1942 and was posted to the 5th Gurkha Rifles (Frontier Force), in early 1943 he was serving with the 3rd Battalion of this regiment on the Assam/Burma borders, close to the Chindwin River. The 3/5th Gurkhas had been posted to Imphal in May/June 1942. William had command of B' Company within the battalion in 1942, but was to also serve as the units Quarter Master for a time that same year. The fate of Lieutenant Kirkpatrick has always been of interest to me during my research and the young officer has featured several times in documents and paperwork relating to Operation Longcloth and the POW's of Rangoon Jail. Although he did not serve on the first Wingate expedition, he did have a direct involvement with the operation and ultimately this was to cost him his life. In mid-February 1943 the 3/5th Gurkha Rifles were given the task of aiding Brigadier Wingate and his Long Range Penetration Force, as they prepared to cross the River Chindwin and begin their operations behind Japanese lines. The Gurkha battalion had paved the way for the Chindit Brigade, checking on enemy garrisons and positions on the eastern side of the Chindwin and then accompanying Wingate's men across the river to guide them safely through the first few miles of jungle trails. Lt. Gouldsbury and Lt. Martin left today with nineteen men each, to go on separate patrols with the Commando Brigade into Burma. Their role is to bring back any wounded, important messages, or even enemy prisoners. A Commando Brigade is now passing through our positions and are leaving masses of equipment on the roads, including maps, bombs, blankets, ropes, grenades, ammo, picks and showels etc. We have been lucky in getting the great bulk of this stuff and it means extensive field firing for every one with all weapons and a great deal over for use in action, all our men are now being given one grenade each. Capt. Buchanan returned from patrol to observe the Commando Brigade's crossing over the Chindwin. He reports there was no enemy opposition. Lt. Gouldsbury returned from the patrol with the Commando Brigade, they were about fifty miles inside Burma when he left them. His patrol is still based at the village of Morei. 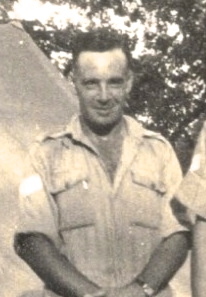 It is not known whether Lieutenant Kirkpatrick took part in guiding the 77th Indian Infantry Brigade across the Chindwin in February 1943, what is known however, is that he was tasked with greeting the returning Chindits in April that year, as small parties of exhausted men began to filter back towards India. 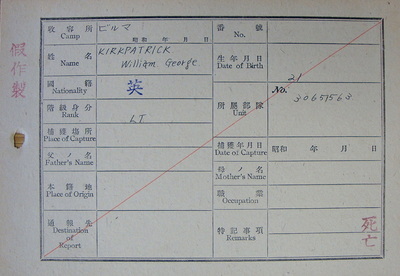 Whilst perfoming these duties William Kirkpatrick was himself captured by the Japanese. Lieut. Kirkpatrick, one Naik, two Riflemen and one Interpreter proceeded on special patrol. The object of the patrol was to recce a jungle track between Saw Kaw & Inbauk which was not on the map but was reported to be used a great deal. 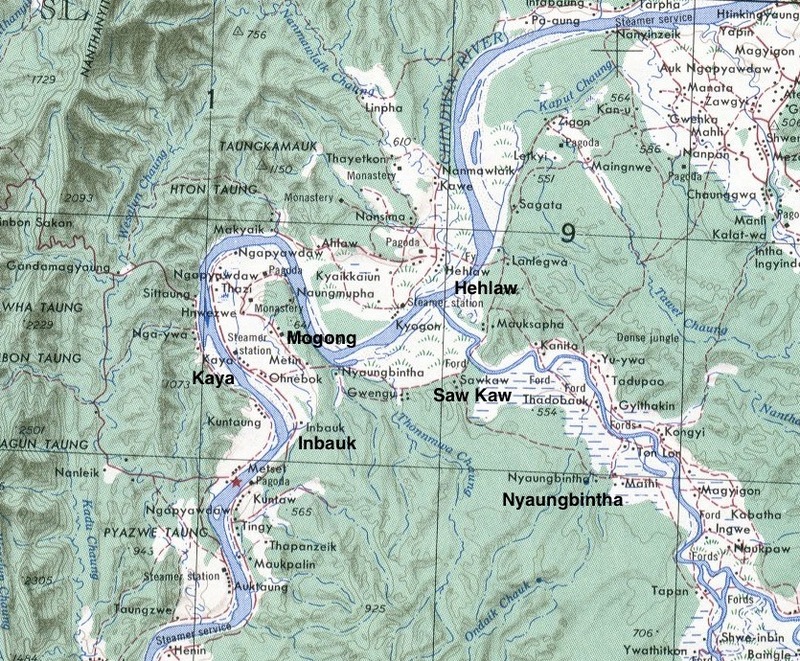 The Patrol Commander (Kirkpatrick) was also ordered to lay two ambushes at his own discretion, one at Kaya and one at Saw Kaw, where the high ground overlooks the single track leading into the river bend area. One Naik and one Rifleman from Lieut. Kirkpatrick's patrol recrossed river. They report that near Nyaungbintha they met with some Burmans. After leaving the Burmans who were cutting wood the patrol went into ambush positions near a track. While waiting in ambush twenty-five Japanese came down the track. The Naik said that Lieut. Kirkpatrick had given orders that no one was to fire unless he did. No fire was opened. The Naik says the Japanese were very close, approximately five or six yards away and were obviously on the alert. After the Japanese had passed the patrol went in single file up the track with about six yards distance between men. The patrol suddenly came under fire and everybody sprang for the dense undergrowth on the right side of the track. The Naik says he searched and whistled for Lieut. Kirkpatrick for over two hours, but when the original Japanese patrol came back he went to a nearby knoll and waited there till darkness and eventually crossed the river near Hehlaw. Lieut. Kirkpatrick, the Interpreter and one Rifleman are now missing. Two Burmese youths, one the son of the village headman of Mogong who were brought in by Naik Dilram of B' Coy, state they have heard that one British Officer was killed and the Interpreter wounded and taken prisoner. From their description there is little doubt that this is Lieut. Kirkpatrick and Interpreter Nathan. In May 1943, the battalion War diary lists Kirkpatrick as 'missing, believed killed.' 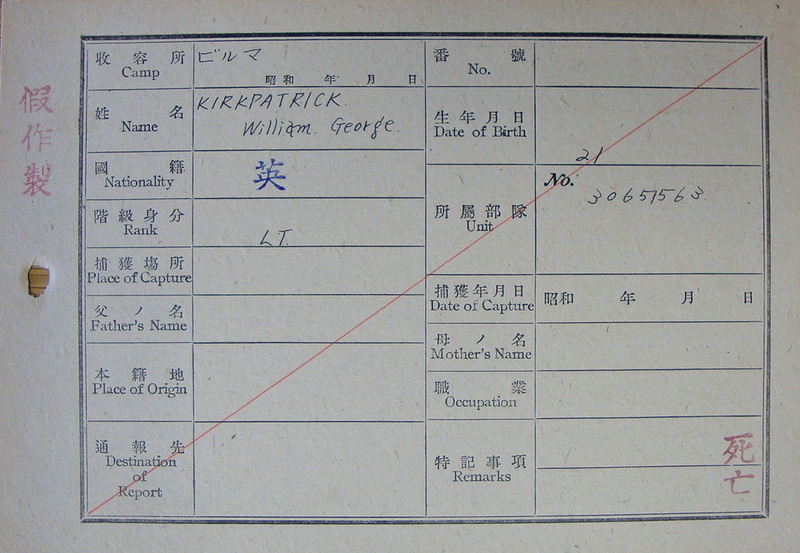 In actual fact, William Kirkpatrick had also been captured by the Japanese patrol and was now a prisoner of war. After originally being held at a camp close to the Chindwin, he was transported, along with several men captured from Operation Longcloth to the main concentration camp at Maymyo. Seen below is a map of the area mentioned in the 3/5 Gurkha Rifles War diary, describing the time of Lieutenant Kirkpatrick's capture. Please click on the image to bring it forward on the page. 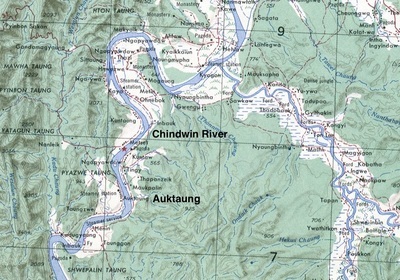 Map of the area around the Chindwin River, where William Kirkpatrick was captured. After capture I was carried off to Maymyo where I spent some weeks and was later taken by train to Rangoon and the jail. My earliest memory of the Maymyo POW cage, while still unable to stand without pain, was of a Jap NCO shouting at me in Japanese. I didn't know what it all meant but in the background I saw another prisoner bowing repeatedly to indicate to me that that was what the Nip wanted me to do. Roses' account of the treatment given out to Lieutenant Kirkpatrick at Maymyo paints an extremely harrowing picture of what happened to the young Gurkha officer in 1943. However, Rose makes one important error in his account, stating that Kirkpatrick was buried at Maymyo on the 3rd July, when in fact his death occurred inside Rangoon Central Jail. 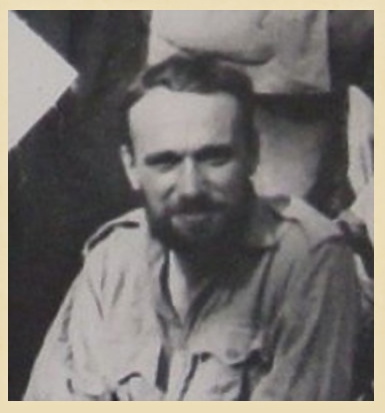 A member of the Wingate expedition (Rose) who became separated after being ambushed by the Japanese, successfully evaded for three days before being captured. 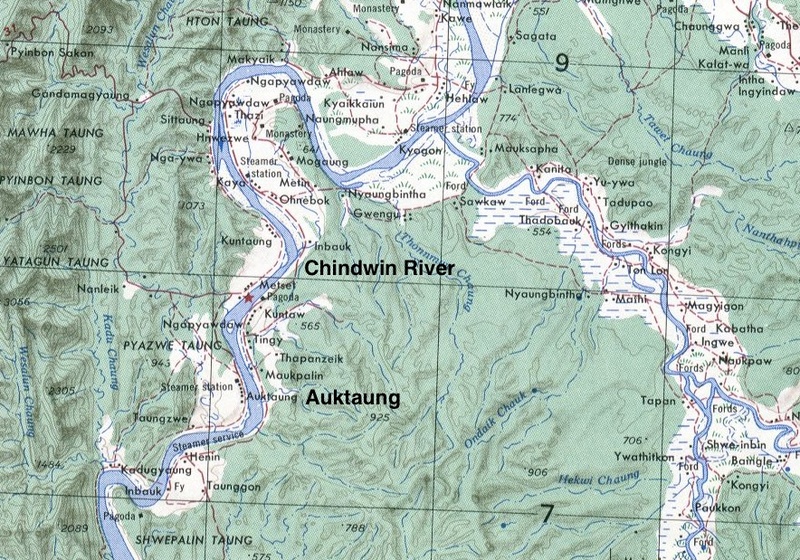 The prisoner was taken to a Japanese HQ near the Chindwin, where he met a group of POW's including an Army Officer (Kirkpatrick) who had been severely wounded. This group were finally moved to Maymyo where they were subjected to very severe interrogation. In the case of the two officers, this went on for many days. They were both continually beaten up with pick helves while the Japanese interrogators shouted a series of numbers at them, asking them what the numbers meant. 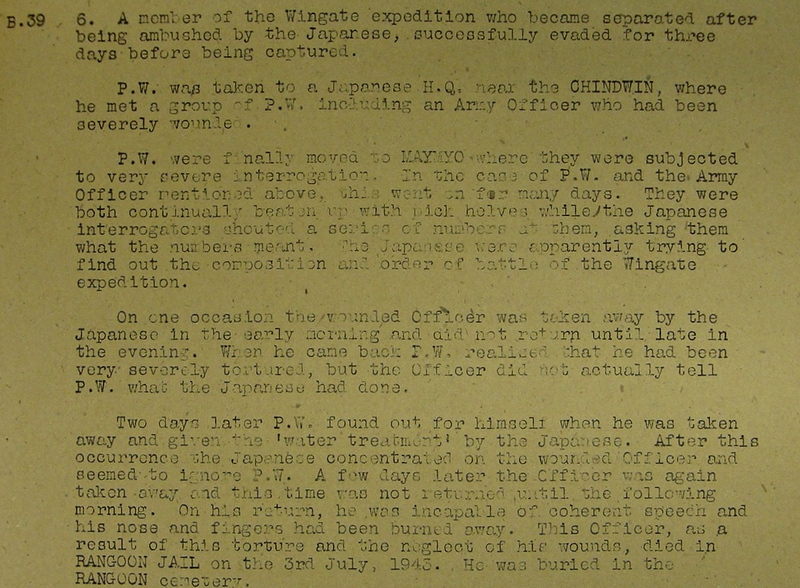 The Japanese were apparently trying to find out the composition and order of battle of the Wingate Force. On one occasion the wound officer was taken away by the Japanese in the early morning and did not return until late in the evening. When he came back it was obvious that he had been very severely tortured, but the officer did not actually say what the Japanese had done. Two days later the other prisoner (Rose) found out for himself, when he was taken away and given the 'water treatment' by the Japanese. After this occurrence the Japanese concentrated on the wounded officer and seemed to ignore the other man. A few days later the wounded officer was taken away again and this time did not return until the following morning. On his return he was incapable of coherent speech and his nose and fingers had been burned away. This officer, as a result of this torture and the neglect of his wounds, died in Rangoon Jail on the 3rd July 1943. He was buried in the Rangoon (Cantonment) Cemetery. "Died in Rangoon of torture, wounds and neglect." Seen below is a gallery of images in relation to William Kirkpatrick and his story; these include the witness statement given by Lewis Rose after his liberation in April 1945 and William Kirlpatrick's POW index card. Please click on any image to bring it forward on the page. William Kirkpatrick died in Block 6 of Rangoon Jail on the 3rd July 1943; his POW number inside Rangoon was 391. According to the Indian Army lists for 1942 William's service number was EC (Emergency Commission) 6413, this was the number given to him on joining the 3/5th Gurkha Rifles. It is likely that William was originally posted to a British Regiment on joining the forces and this might relate to the service number 30657563, attributed to him on his POW index card as shown in the above gallery. This number has too many digits (8) to be correct, but in my experience this type of POW card often contain errors. This is hardly surprising when you consider the circumstances of capture for many men, with some suffering from wounds and others debilitated by exhaustion and disease. William was buried at the English Cantonment Cemetery which was located in the eastern sector of the city, close to the Royal Lakes. By all accounts, Lieutenant Rose was present at his short funeral service along with other fellow officers, the burial party recorded his grave number in the cemetery as No. 65. 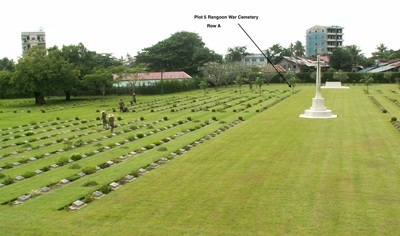 After the war was over, all the burials at the Cantonment Cemetery were removed and most of the men who perished inside Rangoon Jail were re-interred at the newly constructed Rangoon War Cemetery. A party of Longcloths arrived here today. They had come back from across the Irrawaddy where they had done some apparently good work and were still fit but looked a very tired. The men of the party consisted mainly of 3/2nd Gurkha Rifles. Another party of Longcloths arrived under the command of Major Calvert, they later left for Tamu. Flight Lieutenant Tooth and three British Other Ranks from Operation Longcloth arrived today. NB. These men had been part of the dispersal group led by Lewis Rose before they were separated close to the Chindwin River on the 26th April. Rose was captured just three days later on the 29th. Sixty-eight Longcloths arrived here this evening commanded by Subedar-Major Siblal Thapa (Chindit Column 2) from Auktang, the very place where they had crossed on their outward journey in February. A party of Longcloths arrived here consisting of Lieut. Griffiths (3 Column), three Gurkha officers and fifty-five Gurkha Other Ranks who had crossed at Auktang the night before. They were weak through lack of food and had with them two wounded men, sustained in clash with enemy, with our doctor having to cut the finger off one of them as it was dead. Another party of Longcloths arrived here today having crossed at Auktang on evening of the 8th. They consisted of two Naiks and twenty-five Gurkha Other Ranks. Subedar Kulbir Gurung (1 Column) and two Gurkha Other Ranks from Longcloth crossed at Auktaung today. He states that he had been with Major Dunlop four days ago when they had a clash with to enemy and that he (Kulbir) had gone forward to make a recce with two Riflemen, but on returning could not find the remainder of the party. One Gurkha Other Rank from 1 Column crossed this morning at Auktaung. He confirmed Subedar Kulbir's account, stating that the others had presumed he had been killed. We saw a fine example of the tenacity and indominatable will of the Gurkha today, when Havildar Tamang of Longcloth passed through here. He was brought through on a stretcher. He with another Gurkha Rifleman must have been away from their party for well over a month and on his way back had sustained a dah (Burmese machete) wound and bullet wounds in encounters with Japs and the Burmese Traitor Army, but in spite of all this he had managed to make his way back although crippled in one leg and one arm. The following year during the Japanese attacks on Imphal and Kohima, both Martin and Gouldsbury excelled when leading their Gurkha platoons against an extremely determined enemy force. Captain John Gouldsbury was awarded the Military Cross for his efforts in halting the Japanese advance at a place called Shenam on the Imphal-Tamu Road in mid-1944. John Gouldsbury died on the 24th November 2007 aged 87. At his funeral service, held at Inverness Crematorium on the 30th November his family asked that instead of flowers, any monetary donations made would be sent to the Gurkha Welfare Trust, thus continuing John's support and love of his fellow Gurkha soldiers. To conclude this particular story, seen below is one final gallery of images in relation to William Kirkpatrick and Leslie Martin. Please click on any image to bring it forward on the page. I would like once again to thank Enes Smajic for his invaluable contribution to this narrative, especially in providing the continued service details of John Gouldsbury and Leslie Martin. During the time spent caring for his fellow prisoners of war, Harold remembered an incident when he was asked to help a young Gurkha officer, who had been brought into the jail suffering from a gunshot wound to his leg. This officer was William Kirkpatrick. A young officer was brought in badly wounded. He had a wound through the fleshy part of his thigh 1 inch in diameter. It hadn’t been dressed for 4 days. When he came with us to the hospital the Jap cleared out the theatre while I took the wrapping off. When the wound had been cleaned it was possible to look from one side of his leg through the hole. We tried to get a mattress for him in his cell, but the Ghurkha who went across to the other block for it, forgot to bow to the Sentry as he passed. The Sentry hit him, then one or two more joined in, sticks and all, and I’ll say he took it like a man, even though his knees buckled once or twice, he was still on his feet when the bastards had finished. 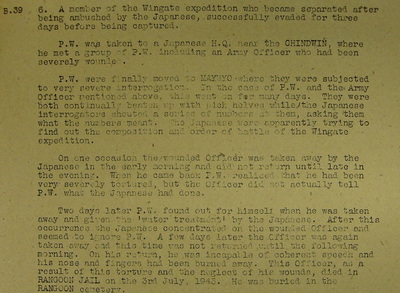 The Japs seemed to think I was RAMC or something, for nearly all the wants of the wounded were attended to by me. I enjoyed being of use and my days were busy and full. The first aid training of my youthful days and common sense, proved useful. We only had one pair of crutches and leg patients took it in turn to use these for exercise. Most of the wounded showed an amazing fortitude and high spirits which made me proud to be an Englishman. The young wounded office had guts. The Japs took him for interrogation one day and brought me to help him into the office. Three hours later I was told to collect him. He had burns to the bone on one hand, a nasty gash on his forehead and they had tried the water torture on him. This was on top of that terrible thigh wound, he was all in. I got a crack on my head for expressing my thoughts and told not to speak. He whispered to me “the bastards are trying to kill me” as I left him in a solitary cell. He never recovered. He was only a boy, 19 years and 6 months old. He died in Rangoon Jail a few weeks later, but he showed the Japs something they’ll never understand; that heroes are born, not made by racial fanaticism. 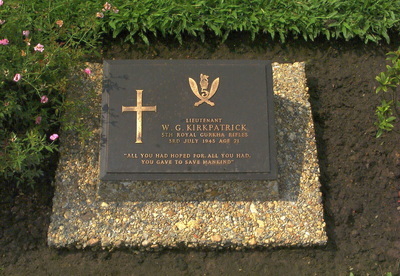 Lt. Kirkpatrick was an officer from a Ghurkha battalion. My hats off to him and God rest him! My thanks must go to Claire McHenry, the granddaughter of Harold Palmer for permission to use the above extract from her grandfather's personal diary. Hi, I would love to talk to you about my uncle, William Kirkpatrick who is featured on your website. My family have some papers about his time in Burma including a notification regarding his death, but we did not know all the details you have managed to put together. I can tell you that William's disappearance and death caused devastation to his family, especially my own Gran. I think it is wonderful that you took the time to put all this together even though it is terribly sad to read. I am serving myself with Canadian Forces and spent sometime in Afghanistan during 2008. A Gurkha Regiment was present at my camp and it made me think about William and I wondered whether he had been a good soldier back then. I have recently switched jobs and am a little busy right now, but I hope to get all the papers together in regards uncle William and scan them and get them over to you. Best wishes, Deb Graf. Sadly, Deb and I have lost touch over the last few years, but I am still hopeful that more information about William Kirkpatrick will come forward from his family. Copyright © Steve Fogden, July 2015.